I hope this newsletter finds you all well. We recently celebrated our 30th anniversary with a gala at Memphis Botanic Garden. If you were unable to attend, you’ll find a brief recap in our cover story, and you’ll find photos and videos from the event on MemphisHabitat.com and on our Facebook page. As you can imagine, the work of 30 years is hard to summarize. Memphis Habitat has served more than 480 families with our home-building and critical repair programs. Their lives have been forever changed by Habitat. Ms. Celestine Hill is one of our homeowners, and she was featured in our 30th anniversary videos and spoke at the celebration. Ms. Hill purchased her home through Habitat in 1992, raised a family there and had an incredible impact on the neighborhood through her own volunteer work. As she spoke at our event, I realized her presence conveyed the gravity of the Habitat mission more than my words ever could. When she expressed her excitement at paying off her home in 2012, the crowd rose to its feet and applauded her amazing achievement. The stories of homeowners like Ms. Hill – hardworking families who would not otherwise have access to mortgages – constantly inspire me and our staff, volunteers and donors. THEY are the reason Habitat exists. 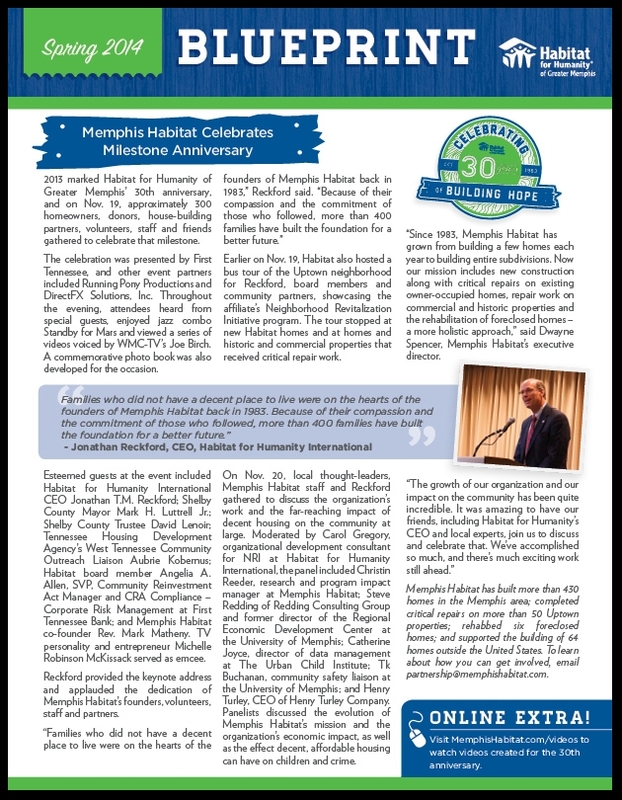 Our 30th anniversary is behind us, and the next phase of Memphis Habitat’s history is well underway. I am excited and encouraged about what the future holds, and I hope you’ll join us as we continue our work in Memphis.